10 x MR11 12v 10watts Clear Halogen Light Bulbs. MR11 2 Pin. Colour temp. Warm white 2900k. Halogen Bulbs. Clear front glass. Cabinet & Undershelf Lighting. Fitted with UV- stop protects against harmful UV radiation. 7W replace 10W - Longer life. 7W replace 10W. In the unfortunate event that your order does not arrive, we provide a straight forward. Colour temperature. Switch cycles. - UV Stop glass. Total: 4 Bulbs. G4 Pins 4mm. Fitted with UV- stop protects against harmful UV radiation. Colour temp. Beam angle. Fitted with Integral safety fuse with build in safety on failure end of life. Incandescent Bulbs & Tubes. 10x CROMPTON QUALITY G4 10w 12v. L-31mm D-8mm. W4 Mr11 Dichroic Bulb 10W 12V. DICHROIC MR11. Halogen Bulb 12V 10W. Cash on collection. Section 1. Section 2. Section 3. Section 4. 9 x 12v 10W G4 halogen capsule lamps by HQ. Quality lamps with a 2000 hour avergae lifespan. Fitted with a G4 cap for push in fitting. Power: 10W. 10 x Halogen light bulb. Energy saving, compact size, higher brightness. Bulb life: more than 1500H. Color: warm white. MR8 Halogen bulb (25mm bulb). MR8 2 Pin 4mm. 3 x 10 watts Clear Halogen Light Bulbs 12v. Colour temp. Beam angle. CE and RoHS. Fitted with Integral safety fuse with build in safety on failure end of life. 5 x 10w MR11 Halogen Spot Lamp Light Bulbs 12v. New Long Life MR11 Halogen bulb (35mm bulb) with Glass cover. MR11 2 Pin. 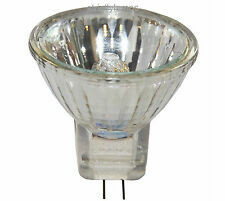 5 x 10w Clear Halogen Spot Light Bulbs 12v. Colour temp. Beam angle. Warm white 2700k. G4 standard size. G4 Pins 4mm. Fitted with UV- stop protects against harmful UV radiation. Colour temp. Beam angle. Energy Rated. Fitted with Integral safety fuse with build in safety on failure end of life. 10w MR16 this is very rear bulb. 5 x MR16 10watts Clear Halogen Light Bulbs 12v. MR16 GU5.3, 2 pin. Colour temp. Beam angle. Energy Rated. Fitted with Integral safety fuse with build in safety on failure end of life. Eveready bulbs have superior color retention and up to 8000 switch cycles, Perfect if you are looking for low energy efficient light bulb solution. Eveready have one of the largest selections. Colour Temp. G4 Halogen Bulbs. Halogen Bulbs. 10watt 12volt G4. G6 Halogen Bulbs. G9 Halogen Bulbs. GU10 Halogen Bulbs. GLS Halogen Bulbs. MR16 Halogen Bulbs. G4 Halogen Light Bulbs. Quantity: 12. G4 Pins 4mm. Fitted with UV- stop protects against harmful UV radiation. Colour temp. Beam angle. Energy Rated. Fitted with Integral safety fuse with build in safety on failure end of life. Constructed to high quality materials with extended reliability. G4 Pins 4mm. Colour temp. Warm white 2900k. Fitted with Integral safety fuse with build in safety on failure end of life. Halogen Bulbs. Ceiling Down Lights. Clear glass. LED Light Bulbs. Halogen Light Bulbs. 12 Volt - 10 Watt. MR8 2 Pin 4mm. 4 x 10 watts Clear Halogen Light Bulbs 12v. Colour temp. Beam angle. Fitted with Integral safety fuse with build in safety on failure end of life. Energy Rated. Incandescent Bulbs & Tubes. Known as an M91 or G4. Long life (4000 hr). Clear glass. We have over 10 years of experience in the lighting industry. Strip Lights. TOP QUALITY. Fluorescent Tube Starters. FAST & FREE. Why buy from us?. We pride ourselves on providing high quality products at the lowest possible prices in the UK. 8 x MR11 12v 10watts Clear Halogen Light Long Life Bulbs. MR11 standard size. MR11 2 Pin. Colour temp. Beam angle. Fitted with Integral safety fuse with build in safety on failure end of life. Incandescent Bulbs & Tubes. 10 x G4 10w. 10 x 10w G4 BULBS. G9 bulbs G4 Led. Clear Glass. Bulbs Clear Glass. Kar Mark Trading Co. FOR ONLY £3.60.